Ahead Of New Book, Comey Defends Handling Of Clinton Email Scandal : The Two-Way The former FBI director stands by his characterization of Hillary Clinton's handling of classified email as "extremely careless" but says he never meant to influence the outcome of the election. 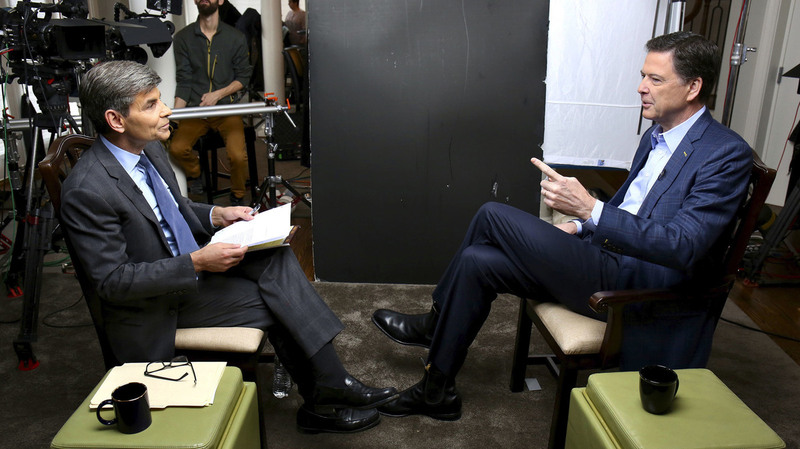 In this image released by ABC News, correspondent George Stephanopoulos (left) appears with former FBI director James Comey for a taped interview that aired during a prime-time 20/20 special on Sunday. Speaking to ABC's George Stephanopoulos Sunday ahead of the release of his new book, A Higher Loyalty, Comey defended his characterization of Clinton's conduct as "extremely careless." However, he conceded that he "should've worked harder to find a way to convey that it's more than just the ordinary mistake, but it's not criminal behavior." Stephanopoulos asked about a September 2015 meeting with then-Attorney General Loretta Lynch just before Comey was to acknowledge publicly that the FBI had launched an investigation into Clinton's use of private email. Lynch, he said, agreed that the announcement should be made but asked him to "call it a matter" instead of an investigation. Comey says that he pushed back but that Lynch was firm: "Just call it a matter," she said. "It did worry me that the attorney general's direction was tracking that effort to avoid using the word 'investigation,' " he said. "To be honest, it gave me a bad feeling." Comey said that by early 2016, the FBI had received "classified information" that "raised the question of whether Loretta Lynch was controlling me and the FBI and keeping the Clinton campaign informed about our investigation." Stephanopoulos: Did you investigate it? Stephanopoulos: And what did you find? Comey: Found no indication that it was true. "I didn't see any indication that Loretta Lynch was trying to cover this investigation for the Clinton campaign or direct me in any way," Comey said. "She stayed away from it as far as I could tell. But the point of it is I knew there was material that might hit the public square any moment, that would allow people to argue powerfully that there was monkey business going on." In a statement released Sunday, Lynch insisted that throughout the investigation, "I did what I always do: rise above politics and uphold the law." In the statement, published by Axios, Lynch said that she had known Comey for 30 years and that "if he had any concerns regarding the email investigation, classified or not, he had ample opportunities to raise them with me both privately and in meetings. He never did." By the spring of 2016, Comey said it was becoming clear that no charges would be brought against Clinton and he began drafting a statement explaining that decision. "There was nothing she said that [FBI investigators] believed we could prove was false," he said. "And there was nothing else they needed to run down to see if she was testifying to us falsely. And so the view of the team was, 'We're done here. Our view of this case is firm. No prosecutor would prosecute this case.' "
Comey said he initially did not pay much attention to an unscheduled meeting between Lynch and former President Bill Clinton on the tarmac at an airport in Phoenix in June. That meeting, just days before Comey initially said the investigation was over — became a major firestorm, with many Republicans saying it showed that the former president was trying to influence the outcome of the investigation in his wife's favor. "I don't know what they talked about. I credit Loretta Lynch [because] I think she's an honest person, saying, 'We talked about grandchildren and other things,' " the former FBI director said. "I find it hard to believe that Bill Clinton would've tried to obstruct justice by walking across the tarmac in front of ... in front of a bunch of FBI agents up the ... stairs and onto an FBI plane," he said. In the waning days of the 2016 presidential election, Comey wrote a letter to Congress outlining the existence of hundreds of thousands of Hillary Clinton's emails discovered on a laptop belonging to disgraced former Rep. Anthony Weiner, whose wife, Huma Abedin, was a longtime Clinton adviser. That letter, some analysts contend, was enough to hand Trump the margin of victory in a very tight race. At the time, Comey said, his team advised him there was no way to go through the trove of new emails by Election Day and he agonized over the decision to make their existence known so close to the national vote. "[All] of us were operating in a world where the polls were showing that Donald Trump had no chance," he said, but he hoped the letter did not sway the election. Even if it did, however, Comey said he still thinks it was the right thing to do. He said he hoped that people would see "I'm not trying to help a candidate or hurt a candidate; I'm trying to do the right thing." "And you can come up with different conclusions. Reasonable people would've chosen a different door for reasonable reasons," he said. "But it's just not fair to say we were doing it for some illegitimate reason."